Fun fact! It is the anniversary of Laura Loves! Less fun fact…I don’t have anything EXTRA special planned for this anniversary edition. March has been a SUPER BUSY month for me…you may have even noticed I couldn’t keep up with my promised Saturday Photo A Day posts this past weekend (whoops! )…I HAVE been taking pictures though and I will post a final recap sometime this weekend! Spring is in the air and I love it! March has set temperature records this month…we have had some days reach almost 80 degrees! I LOVE mid-high 70s so I am in heaven with the weather this month! I am living in a new place this spring outside of DC and my complex has been such a great place to watch spring bloom! And baby leaves started to form all over the trees while even more trees bloomed! Right now there are really pretty and very bright purple and pink flowering trees. This new complex I am on really has some great trees to watch to get you excited for the spring. It seems like they all bloom at different times too which makes the entire month lovely! Yup…Segways! This month I met my friends Avi and Shirin in the city to take advantage of deal we got on a Segway Tour of DC! The tour hit up the usual spots we had all seen (although we did learn a few fun facts! )…but we really wanted to try riding Segways…and let me tell you…it is pretty cool! Before you start the tour they have to show you this safety video…showing all of the hazards of riding a Segway. If you have never ridden a Segway before…this video can definitely make you nervous. It’s long….but some of the animation is funny/nerve wracking…skip around to see if you can find some. It was kind of hard not to laugh off your nerves a bit. While riding the Segway feels really odd at first, it’s really cool how fast it starts to become sort of like an additional appendage! After only a few minutes I noticed that I wasn’t thinking about what to do to control the Segway…I was just thinking about moving (like I just think about walking)…it really is a really cool device! If you haven’t been to DC before or in a long time. I think the Segway tour is a fun thing to do. If you have been to DC….I’d recommend doing it, but maybe waiting for a deal like Groupon. It’s a pretty basic tour of the hot spots around the National Mall…but you can get it done pretty fast on the Segway. About a year ago I read all three books in the series The Hunger Games by Suzanne Collins. I absolutely loved the series. It was such a good story about a dystopian society (I’m a sucker for the dystopia theme) where the Capitol keeps it’s “districts” (similar to states) under control by making them sacrifice a boy and a girl each year to fight to the death for entertainment. Sounds crazy and gross I know…but it is really a very good story. Well it was soon announced that they were going to be making a movie of the book…and I was REALLY excited. Now I have been waiting over a year for this film to come out. So opening weekend I went to see it with a few other friends who had also read the book. I really really really liked the film. I thought they did a great job of staying true to the book as much as they can in a film adaptation. One of the major differences from the film and book is the point of view. The book is told from the main character, Katniss’s point of view while the movie is third person. Because it is third person the viewer gets to see a lot of things that Katniss didn’t really see or find out about. She had some ideas about these things though and the movie brought that side to life. At the same time, they had to figure out how to show what Katniss was thinking without her really “talking to herself” too much as if she was narrating like in the book. I think the adaptation was very well done and because of the different points of view I do think it is a good idea to experience both the book and the film. As usual…one of my favorite YouTubers Daily Grace made her own great video adaptation of the book. Of course I love that this month too!! If you haven’t read the books or seen the movie….SPOILER ALERT….don’t watch the video below! Another fun thing I was planning on doing this month was horseback riding and wine tasting through Living Social Adventures! My friend Megan and I met up at the Living Social headquarters that Sunday early in the morning only to find out that due to some rain the adventure had been canceled . It actually had been canceled that Friday but the email was messed up and a whole group of us hadn’t gotten it. We were disappointed but sent away learning that the event would be rescheduled. Megan and I both crossed our fingers that it would be on a weekend we could both do! A few days later we received and email confirming that we were rescheduled for a weekend we could both go!! But that isn’t the best part…it is a weekend in May so it will be even nicer out!! But that isn’t the best part….it is rescheduled for a Saturday which I would have probably preferred in the first place (Sunday was the only day the original weekend that would have worked for us)! !…But that isn’t the best part….we ALSO got full refunds for the trip so we will be going for free!!!! Wooohooo! It is unfortunate that there was a miscommunication but I think Living Social did more than enough to make it up to us. I’m sure I’ll be writing about this adventure in May…but at this point Living Social Customer Service has done more than enough to get a thumbs up from me! I can’t wait for this trip! As you have probably noticed from the types of posts dominating my blog this month, I have been enjoying doing the Photo A Day challenge. But that is not the only “A Day” thing I have been keeping up with this year. 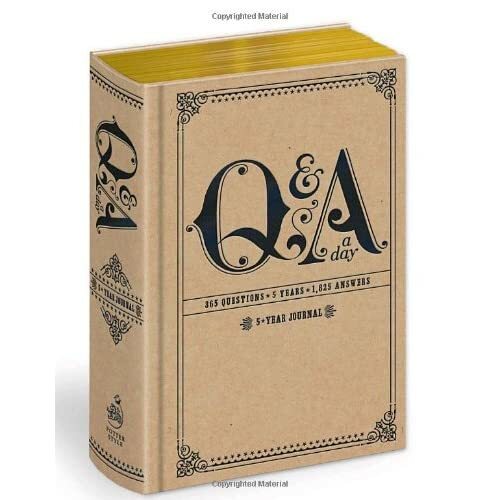 Over the holidays, my sister got me this Q&A A Day 5 Year Journal. Each page has a day of the year and a question to answer in a sentence or two. There is a few lines for 5 separate years under the question. Each night before bed I read the question and answer it. I *hopefully* will keep this up over the next 5 years so I can see how my answers (or how I) have changed. Some of the questions are more serious, and some are simple…but I’m loving it so far! I’ve been really good at keeping up with it up to this point so I’m hopeful I can keep it up. If you aren’t into questions, they also make a One Line A Day 5 Year Journal that Rebecca wrote about. I find that I personally like having a question to focus on each day but I know others like more freedom. Guided creativity works better for me sometimes haha. But I’d highly recommend either one. Keep it next to your bed and its hard to forget. And it doesn’t take more than 2 minutes of your day to have a great 5 year snapshot. This month I am so proud to LOVE Loyola University Maryland’s Men’s Basketball Team! For the first time since the 90s (and only second time ever) they won their conference (MAAC) and made it to the NCAA Tournament! When I first got to Loyola, the men’s basketball team was known for being REALLY bad. In fact, they almost set the record for most consecutive losses. The game before they broke that record…they won. That spring, Loyola hired head coach Jimmy Patsos. Patsos totally rejuvenated the team. Not only by working on better recruitment, but by getting STUDENTS excited about the games. You would not believe the transformation. No one used to go to basketball games at Loyola…but by my Junior year…the arena was PACKED with students. While the Greyhounds had some heartbreaking losses….they were playing exciting games and winning a good number of them too! Patsos would thank the students for coming out and supporting the team after every single game…and he often referred to us as the 6th man on the court. The love was mutual. Now, the Greyhounds are the team to beat in the MAAC! I was so excited for them winning the MAAC and going to the Big Dance! But I wasn’t the only one…my Facebook became a mini Loyola Pride reunion. Everyone was posting how proud they were of the team and everyone was liking everyone else’s posts…it was so cool…you could feel the unity and pride. Unfortunately the Hounds didn’t make it past the first round…but it was great experience for them and they have a lot of players remaining on the team for next year. Here is hoping they can find their way to the dance again soon! Go Hounds! So proud of the awesome season! Check back next month for another edition of Laura Loves!